On November 29 at the Coutts border crossing, officers seized four undeclared handguns – including two with prohibited status – while examining a pickup truck and flatbed trailer. 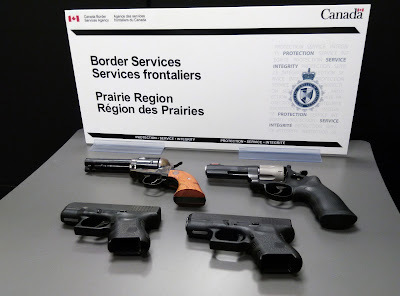 The CBSA has since charged Craig Andrew Chalmers, 46, of Alaska on six counts, including smuggling under the Customs Act. He was released on a recognizance and is scheduled to make his first appearance in Lethbridge Provincial Court on January 18, 2017. On November 17 at the Coutts border crossing, officers seized a loaded, prohibited .25-calibre handgun while conducting a vehicle examination. Elmer Leroy Meddock, of Great Falls, Montana, is facing CBSA criminal charges on four counts, including smuggling under the Customs Act. He was released on a recognizance and is scheduled to appear in Lethbridge Provincial Court on January 18, 2017. 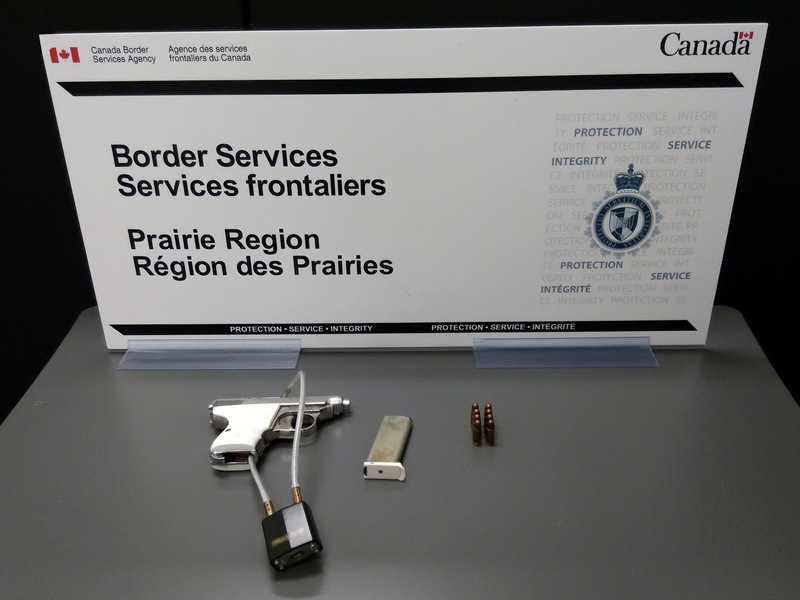 At the Wild Horse border crossing on November 18, officers intercepted an impaired driver from Saskatchewan as he was returning to Canada. During a routine secondary exam, officers uncovered alcohol in a pop bottle and required that the driver complete an approved screening device test, which he failed. The man was arrested and turned over to Royal Canadian Mounted Police. At Coutts on November 7, a U.S.-resident commercial driver convicted of possession of methamphetamine. At Wild Horse on November 15, a U.S. resident convicted of domestic assault. At Coutts on November 25, a U.S. resident convicted of burglary and theft. The CBSA reminds Canadians picking up parcels in the U.S. this holiday season to know the contents and the value of their parcels before re-entering Canada. If returning with gifts, please ensure that the gifts are unwrapped when crossing the border, as a CBSA officer may need to open the package to verify your declaration. Coutts welcomed 398 new permanent residents, while 160 entered Canada at Carway. Officers at Coutts, Alberta’s busiest border crossing, refused entry to 29 foreign nationals for various reasons, including criminality. At Carway, which processes the second-highest traffic volumes, officers refused entry to 10 foreign nationals.